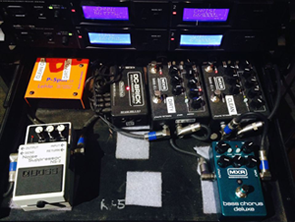 Jim Dunlop Guitar Products has shared a photo and some information on the bass effects touring rig Johnny Christ is currently using on tour. Note the two MXR M80 Bass DI+ pedals—one for the clean channel & one for the dirty channel—and the MXR Bass Chorus Deluxe! ← ARTE Concert Streaming Avenged Sevenfold's Set From Hellfest 2014.